Photography Blog has reviewed the ultrazoom Sony Cybershot DSC-HX1 compact digital camera. 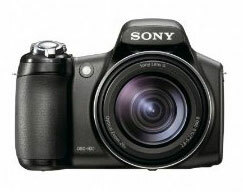 This Sony camera is quite interesting with its 20x optical zoom lens that are supposed to be of high quality. Let us see what the reviewer at Photography Blog thinks about this camera. Photography Blog ends up giving the Sony Cybershot DSC-HX1 ultrazoom a “Highly Recommended” 4.5 out of 5 stars rating. The camera scores highest on design, features and value for the money. It also has pretty good image quality so the HX1 seem like a very strong ultrazoom camera. Read the full review of the Sony Cybershot DSC-HX1 camera here.